Firefeed (formerly Bmail) is a online marketing tool, mostly aimed at allowing a company or an individual to send html format emails or newsletters to a large number of contacts within their contact list. But it’s not limited to that. Firefeed is also aimed at being a comprehensive marketing tool and therefore allows one to administer their contacts and arrange them into contact lists and also import/export to and from other contact managers. 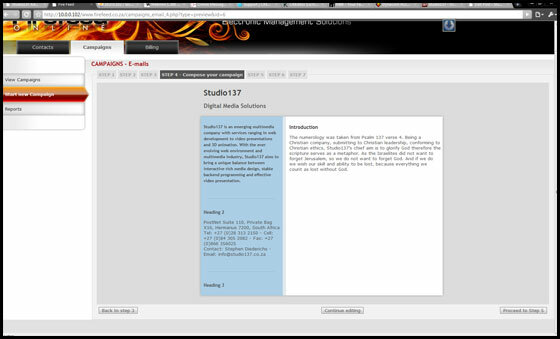 And, in the near future, to create SMS campaigns, run surveys, rss feeds and podcast/vodcasts using the system. In the distant future we also aim to add a billing section to manage accounts. 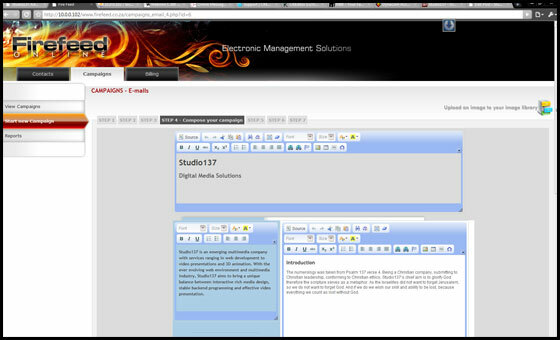 For a year and half Studio137 has been developing the system, having first called it Bmail. Unfortunately Bmail never got off the ground since it had bugs and forced us to manually setup and prepare campaigns for clients to send. Taking all the valuable lessons learned from Bmail and the already built systems, we decided to re-develop it and called it Firefeed. Now with about half the code and with a far more user friendly interface we have a more efficient system and we are almost ready to release it in beta. What this means is that current Bmail clients will be transferred to this system and will be able to make use of it before it is officially launched next year (date to be announced). So here are a few of the improvements and the additions that will be available in the beta and then in the final release next year. Far easier contact management system. Bmail had many ways to do one thing. Firefeed now has one way avoiding confusion and also allows all contact lists to be available at one click from anytime you’re in your ‘view contacts’ page. Firefeed uses templates now as opposed to solely relying on a WYSIWYG editor. For Bmail clients who have tried to use the current editor to setup an attractive email, they will have noticed the difficulty and frustration of trying to save tables and add images etc and even the easier tasks of making a paragraph bold. Firefeed now is improved by limiting the use of an editor to only the content that requires a change and therefore the template structure always remains fixed. We also can easily incorporate custom templates which we can develop. After you’ve previewed your campaign you can send a test message immediately. In Bmail this option was only available after compiling your outbox, which can be a lengthy process if you have a large contact list. Limited reporting will be available in the beta version. Currently Firefeed (www.firefeed.co.za will be available on the 9th December 2009) is not running on a live server so we included below 3 screen shots. Firefeed makes use of the full width of your monitor. Therefore clients with widescreen monitors will enjoy the ability to view contacts at one point. 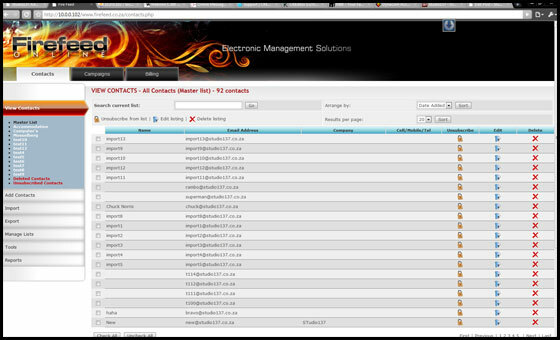 A view of the ‘View Contacts’ page which allows you to edit and manage your contacts and arrange them into lists. A view of the template when it is previewed. Firefeed works on a per email basis. You have 3 options for payment: monthly, pay as you go and once off. One email is one credit. Please note that and email cannot be larger than 512KB. If it exceeds this limit then it is counted as another credit for each 512KB after that. For the monthly installment option only half of your allow credits will be carried across to the next month. eg. If you have 5000 credits per month and you only use 1200 in one month then only 2500 credits are carried over to the next month and not 3800. Therefore you can never have more than 7500 credits in any month. Sms pricing will come at a latter stage. Yep, Steve, let me know when firefeed is ready, we would like to subscribe. Hey Karin. Only noticed your comment now amongst all the spam, so I finally got a captcha form to stop the bots. You can signup to Firefeed for a 10 day free trial if you wish. It’s working now. There’s still some things I wish to update, but as I’m sure you realize it’ll always keep growing and more will be added.